Stealing their thinking at recess: Are you telling or asking? Last year I wrote a post asking teachers to reflect on whether or not they are stealing their students’ thinking. At the time when I wrote that, my understanding was that an inquiry-based approach to teaching was something that happened within the classroom – an approach to academic teaching. Now as my own understanding of inquiry grows and evolves I am starting to see how inquiry as a philosophy should inform our interactions with students throughout the entire school day and extend to include those teachable moments about behaviour, personal choices and social interactions. The biggest part of the school day, where I have noticed that an inquiry-based approach is missing… is at recess. Recently, I have tried to be an inquirer at recess and observe how teachers deal with problems and situations. 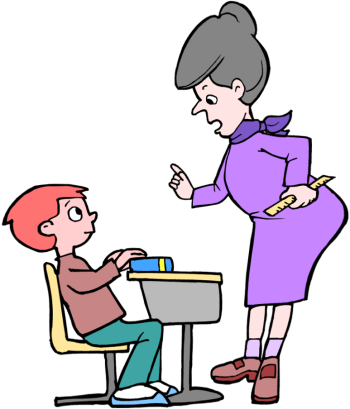 More often than not I am seeing and hearing teacher telling students what they did wrong, why it was wrong and what they need to do next time. Where’s the thinking in that? I have to admit that before reading a blog post from @h_sopeirce about her Magic Question, I too was approaching recess interactions this way. But when I started to use the magic question “What will I see differently next time” in my conversations with students I started to see the power of asking instead of telling. I realized that for as long as we are telling students what they did wrong, why it was wrong and what to do next time, we are stealing their thinking. We are doing the thinking and reflecting for them and all they have to do is look at us and listen. How can we expect change in their actions or behaviours without helping them reflect on and change their thinking? How can we expect them to change their thinking, if we are doing their thinking for them? What do you think I would like to speak to you about? I have found this is a key question. If our goal is to have our students be truly reflective, then they need to be the ones who notice and name their undesirable behaviour and I have yet to have a student who is unable to do so when asked this question. Why do you think that is a problem in our school community? I have noticed that many times I have asked this question and students truly have no idea why their choice or action is problematic. How can we expect students to behave a certain way if they do not understand the reasons behind those expectations. I have also noticed that this question allows students to develop the understanding that sometimes expectations for school look and feel different from home and it is important to understand why in the context of school a certain behaviour or action is not welcome. What will I see differently from your next time? This is the magic question from the Globally Minded Counsellor. Check our her post to see why it is so magical! And if I don’t see that next time what should I do? This questions is an interesting one for a few different reasons. First of all because it throws the students for a loop. Most of them are thrown when they realize I am asking for their advice about what to do as a teacher. Second, the suggestions are usually grossly disproportionate to the behaviour. “Send me to the principal office” or “Call my parents” or “Expel me” are typical pieces of advice for choices like running in the halls or throwing garbage on the floor. Thirdly, their suggestions are usually quite punitive and come in the form of punishments. This requires some guidance and reframing that my job is to help them learn about their choices and grow as people, not punish them and I am looking for a suggestions that will help them think about their choice and hopefully learn from their mistakes. If we think of the golden 80/20 ratio we strive for within the classroom (where students are doing 80% of the talking and teachers are only doing 20% of the talking), perhaps we should be striving for the same ratio during recess conversations. Afterall… whoever is doing the talking is doing the thinking. So if we are doing all the talking in a conversation with students at recess, we can be pretty sure that we are stealing their thinking. 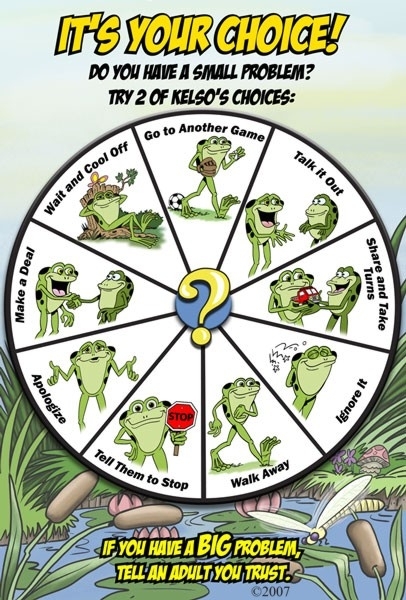 At our school when students have a small problem, we encourage them to solve it for themselves using Kelso’s Choice. We have had so much success with this program, I would encourage you to check it out! But when it comes to larger problems where an adult needs to step in, how can we truly help work through these problems, but also ensure that students are learning peaceful and productive ways to deal with conflict? Can you and you please come have a chat with me so I can help you solve your problem. I am going to help you solve this problem and I am going to give each of you a chance to tell your side of the story, but first we need to agree that we won’t interrupt each other when someone is telling their perspective. Can you please go first and tell me, in your opinion, what happened? Second Chance – Unfortunately your stories aren’t matching and I can’t help you solve your problem until I understand what actually happened. So I’m going to give you a second chance to really think and see if there are any parts of your story that you want to change to make them more true. Clarifying Terms – You said he hit you. He said he didn’t. What did you mean by ‘hit’? Think about what you just heard about why the other person is upset and tell me what you might have done in this situation that was not the right choice. Now that you know how you made this person upset, what can you do to make them feel better? How could you have handled this situation differently? What different choice could you have made to solve this problem more peacefully? Do you feel this problem has been resolved? After problems have been resolved it is nice to show a gesture of peace that says, ‘problem is solved, let’s move on’. What would you like to do to show peace; high five, hand shake, fist bump, chicken wing, nod etc.? True this model takes time, which is often something that comes at a premium during the teaching day. But, I often find that these steps allow me to work through student conflicts without needing additional help, so I try to make time for them. If I’m on duty at recess I will often find a grassy spot or picnic table where we can sit down and chat. If it happens during class time, I take the first opportunity possible when students are doing independent learning to gather the students involved at a guided reading table. Or when there is no other option, I tell the students to wait and cool off and we will do some problem solving together privately at recess. Sometimes it feels like these ‘teachable moments’ get in the way of the learning we have planned for our students, but what could be more important in the pursuit of helping to make good humans, than helping students learn how to peacefully work through conflict? How do you help teach students to work through their conflicts?